Everyone loves Gumbo. No one likes to make it. But really, it isn't that difficult. I developed this (relatively) simple, totally from scratch recipe for all the Canjun food lovers who have been too intimidated to try making their own. You can use different meats if desired as long as you end up with approximately the same total amount. Try omitting the chicken & sausage and using fish and crab meat for a delicious seafood gumbo (pan-fry the fish & shred before adding to gumbo; add crab meat when you add the shrimp). Another variation is to use several different types/flavors of sausage, or use only chicken (increasing amount to make up the difference). 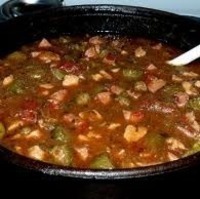 You can also omit the meat entirely & throw in a bag of frozen vegetable gumbo blend from the supermarket (or just increase the amount of fresh veggies used) for a delicious vegetarian gumbo. Melt butter over low heat in a small, thick-bottomed skillet or sauce pan. Slowly add flour, stirring constantly with a fork or wire whisk to prevent clumping or burning. Continue stirring over low heat until the roux reaches a dark chocolate brown consistency but do not allow to scorch - it's better to have a lighter roux than to let it burn at all so if you're not sure go ahead and take it off the heat once the flour has been incorporated. Stir in dried seasonings and cilantro and set aside. In a large skillet, saute chicken in 2 tbsp olive oil. Transfer chicken to large cooking pot. Saute onion, celery, and peppers in skillet, using additional olive oil if needed. Transfer mixture to large cooking pot with chicken. Add corn, okra, shrimp, and sausage. Add chicken stock and water and bring to a boil. Reduce heat and simmer for 10 - 15 minutes. Slowly stir in roux and tomato sauce. Simmer for an additional 10 - 15 minutes. Cheater tip: If your gravy didn't get quite thick enough (common frustration for beginners), don't despair. 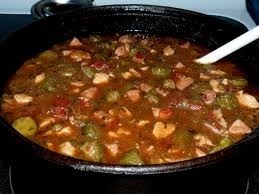 Just mix 1/2 tbsp corn starch with 2 tbsp water and slowly stir into gumbo, and simmer for an additional five minutes. I've always wanted to try making gumbo. Thanks for sharing!